In forests of towering trees covered in moss and ferns lives an elusive and remarkable animal: the tree kangaroo. Locals call it the “ghost of the forest” because it is so hard to find and moves so quickly. No one is exactly sure when this small marsupial in the kangaroo family took to the trees, but it is clearly well adapted for life on high, with long, bark-gripping claws, strong limbs for climbing, and a long tail for balance. These are good traits to have for a species that spends most of its time 100 feet or more above the ground, nibbling ferns and orchids and looking out at dizzying views over the forest canopy. Branching Out With its powerful limbs and long tail, the Matschie’s tree kangaroo is built for climbing trees! Topping out at around 22 pounds, Matchie’s may not rival their bigger brethren like the western gray kangaroo in size (those ‘roos can weigh up to 120 pounds), but this mighty little mammal is adaptable, finding its food both in tree canopies and on the ground. The Matschie’s tree kangaroo has thick, dense fur that is reddish-mahogany on the back, and a dark stripe down the spine. Tannins in the leaves it chews give the Matschie’s tree kangaroo’s coat its reddish color. Its limbs, feet, and ear tips are yellow, and its face is white or cream color. 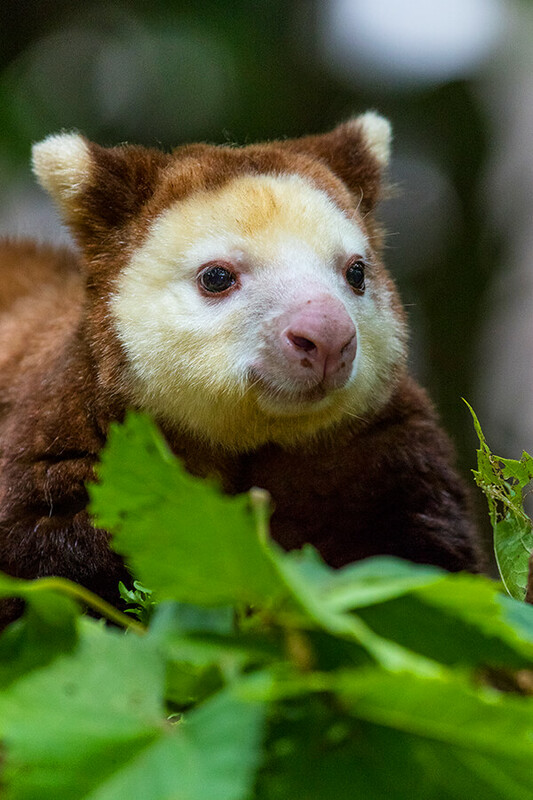 The Matschie’s tree kangaroo’s coat helps the animal in two ways: Its fur is thick enough to keep the animal insulated against damp weather, and its coloring camouflages for protection against predators—including humans! These tree kangaroos have long, sharp claws on both front and hind feet that help them climb trees with ease. Patches of roughened skin also help with gripping. Stocky in build, the animal’s muscular forelimbs and approximately the same length as its hind legs. Of all the Dendrolagus species, the Matschie’s tree kangaroo is believed to be the best vertical climber. Rain forest, sweet rain forest. The Matschie’s tree kangaroo has a very small home range. Found only in New Guinea, the Matschie’s tree kangaroo is endemic to the Huon Peninsula, giving the species its other common name, the Huon tree kangaroo. Spending most of its time in trees, the Matschie’s tree kangaroo is arboreal, living in mid-montane to upper-montane cloud forests at elevations of up to 11,000 feet. On the ground, tree kangaroos are slow and uncoordinated, but in the trees they are bold and agile. The secret life of tree dwellers. 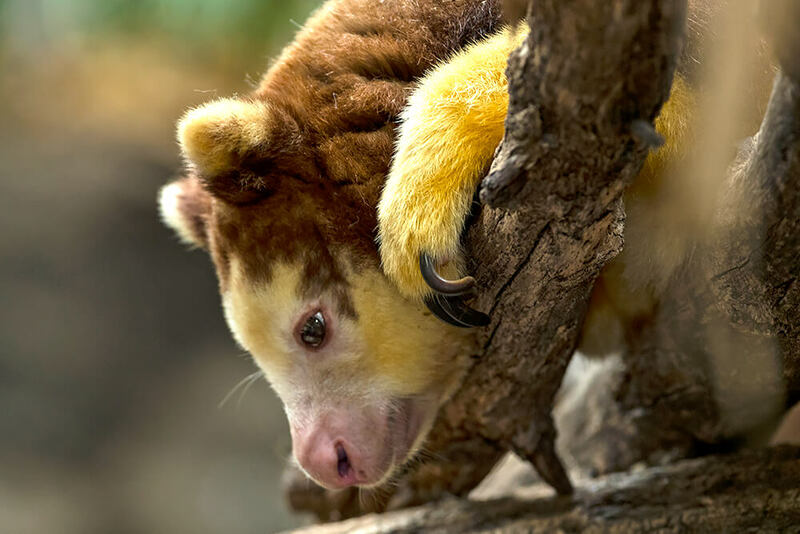 Despite their climbing and jumping abilities, tree kangaroos sleep 60 percent of the time, curling up in whatever tree they happen to be in. Solitary animals, Matschie’s tree kangaroos are live-and-let-live sorts, basically ignoring one another even when sharing the same tree. Females do not share territories. Territory size of females averages 4.5 acres, while males claim overlapping territories of 11 acres. Larger territories increase breeding opportunities for males. Just browsing. In the wild, Matschie’s tree kangaroos are folivorous, eating leaves from a variety of forest trees, vines, ferns, orchids, shrubs, and herbs. The animal might supplement this diet with small amounts of fruit and flowers, tender grasses, and even tree bark! Pouch patrol. Having no defined mating season, female Matschie’s tree kangaroos go into heat every 51 to 79 days. Solitary in nature, the animals only come together to mate. Following a gestation of approximately 40 to 45 days (the longest of any known marsupial), the undeveloped joey is born and must climb up the mother’s belly, into her pouch, and find a teat to latch onto. Being a marsupial, female Matschie’s tree kangaroos carry their joey in their pouch for 8 to 10 months; but even after the baby leaves the pouch, it may return to nurse for up to 2 months afterward. Then, it’s off to make its own home. Say what? Even though Matschie’s tree kangaroos are quiet by nature, they still manage to get their point across. They communicate via visual display, touch, some vocalization, and, most importantly, through chemical cues. 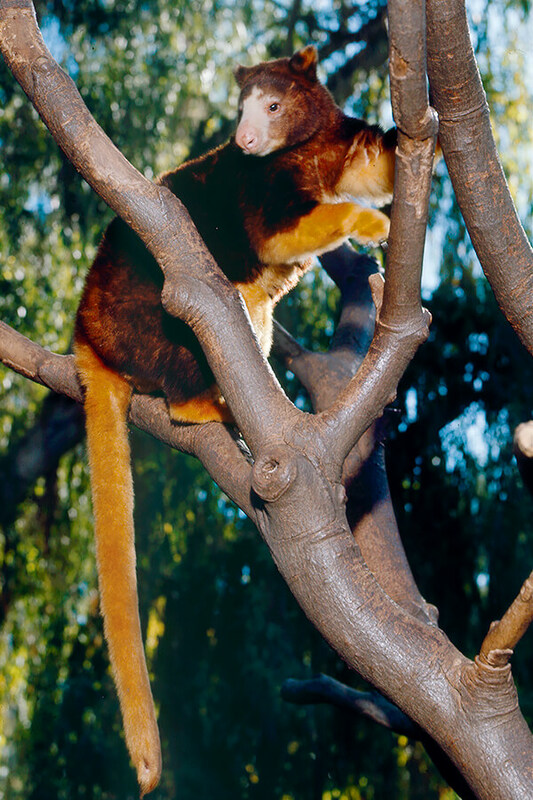 Matschie’s tree kangaroos can be seen at the San Diego Zoo Safari Park’s new Walkabout Australia experience. Hunting for solutions. It is estimated that there are fewer than 2,500 adult Matschie’s tree kangaroos left in the wild, and their population is dropping. They are hunted by humans for food and trade. Habitat loss due to expanding agriculture further threatens their population. You can help us bring species back from the brink by supporting the San Diego Zoo Global Wildlife Conservancy at endextinction.org. Together we can save and protect wildlife around the globe. Males about 26 inches (66 centimeters), plus a tail nearly equal to body length. Females are slightly smaller. Jump to it! Matschie’s tree kangaroos can leap 60 feet to the ground without injury. Like water off a duck’s back. Curly whorls on the tree kangaroo’s back fur let water run right off it.